What is your ideal Customer demographic? Do you advertise anywhere else? If so what is your Budget? How do you measure the efficacy of your current Advertising? Do you do any search engine marketing? How well do you currently rank on Search Engines? How well does your competition rank on search engines? Where would you like to rank in the search engines? If yes to the previous Question. What was your monthly budget? What industries do you advertise in? Where do you conduct most of your business? Is your business seasonal or year -round? How happy are you with your visibility online? Do you use social media for personal use? Do you have business dedicated accounts? Do you post special deals via social Media? Are you happy with your interactions with clients on social media? Are there any other social media platforms that you want to use? How would you rate your online reputation? Yes No Would like to. How happy are you with your social presence and online community? 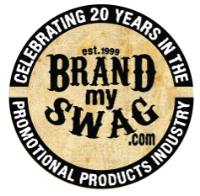 Brand My Swag Web will be in touch with you to schedule an appointment with a Product Specialist. A Product Specialist will anser your queistons, demonstrate our technology and help you to determine if our solution can benefit your business or organization.